It is never easy to deal with panic attacks.The nighttime (nocturnal) panic attacks can throw you awake in the middle of the night and leave you feelings of immense fear and distress. 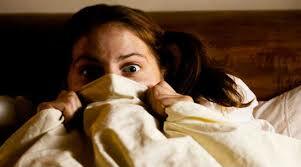 A panic attack while sleeping can cause significant distress because it affects your sleep quality in a negative way. Most nighttime panic attacks produce symptoms such as hyperventilation, difficulty breathing, and a rapid heartbeat. You may also experience leg and arm numbness or twitching. It is also possible to feel chest pain and tightness, which can be so severe at times that you may feel as if you are having a heart attack. Some people who have nocturnal panic attacks wake up with a feeling of suffocating or choking. They usually wake up making a gagging sound. Keep in mind that if you wake up suddenly in the middle of the night because of choking, it could also be due to a condition called sleep apnea that causes a blockage in the airways. A very common symptom of nocturnal panic attacks is heavy sweating. You may wake up suddenly and find yourself sweating a lot. You may also notice changes in body temperature, such as feeling chilled or hot flashes. Some people also experience flushing in the face when they have a nighttime panic attack. Every time you have a panic attack when you are sleeping, you will always experience an intense feeling of fear. The feeling may last up to 20 minutes or so, and you may feel disassociated from reality during this time. When you have other physical symptoms as well, such as sweating, irregular heartbeat, etc., you may notice your fear become worse. What causes panic attacks is not clear yet, but experts believe that many possible conditions may contribute to triggering a panic attack. In this condition, the blockage in your upper airway causes you to stop breathing while sleeping. Sometimes, you stop breathing for up to 30 seconds. You usually develop this condition when there is excess fat and tissue around your neck area, which puts pressure on the airway and causes a blockage. This leads to an increase in carbon dioxide, with oxygen levels coming down at the same time. Someone with a panic disorder wakes up suddenly due to blocked breathing and experiences other physical symptoms, such as tightness in the chest, shortness of breath, etc., which leads to a full-blown panic attack. Acid reflux disease can cause difficulty breathing, chest pain, hyperventilation, night sweat, and many other symptoms that mimic serious health problems. The condition can make you wake up in the middle of the night, and when you already have a panic disorder, you are more likely to experience a panic attack due to this condition. If you have a panic disorder, you are likely to develop a chronic breathing problem called hyperventilation disorder. You can still breathe normally during relaxation, but sometimes, the issue can be more severe and can wake you up from your sleep and trigger a panic attack. You may end up experiencing a panic attack at night when anything makes you anxious. You may feel anxious when you are having a nightmare, which in turn can make you breathe quickly. Breathing quickly in your sleep can cause a hyperventilation, which can lead to a panic attack. When your panic attacks are directly related to GERD and losing weight does not produce desired results, you may want to take medications to treat GERD. You can take antacids as well as OTC acid reflux medications to control GERD symptoms. Most patients respond well to supportive counseling, while others require psychiatric treatment. You may require both in some cases, and it is important to talk to your doctor and determine the best treatment approach for hyperventilation. Working with your doctor is important because he or she can help you learn about maximal exhalation and diaphragmatic breathing. You doctor also helps identify any underlying anxiety disorders and recommends treatments that may include stress reduction techniques, cognitive therapy, and a combination of these techniques. Create a reminder sheet and keep it near where you sleep. You can write a few pointers to help relax your nerves when you wake up and experience nighttime panic attacks. You can check the list and try whatever tips you have written there. This may also help distract your mind and make you feel better. When you have a panic attack while sleeping, you should focus more on your breathing and make a conscious effort to breathe through your nose and exhale through your mouth. Be sure to draw in a deep breath that fills your lungs with oxygen. Your ribcage and belly should expand while inhaling. Be sure to exhale slowly until your ribcage and belly contract again. Continue with the exercise until your heart rate drops again. Moreover, you need to be aware of what is happening to you and know the early signs of a panic attack. This allows you to take your anti-anxiety medication that can help prevent an attack.